Her newest work is an answer to this plea. Using her background in adult development, complexity theories, and leadership consultancy, Garvey Berger discerns five pernicious and pervasive “mind traps” to frame the book. These are: the desire for simple stories, our sense that we are right, our desire to get along with others in our group, our fixation with control, and our constant quest to protect and defend our egos. In addition to understanding why these natural impulses steer us wrong in a fast-moving world, leaders will get powerful questions and approaches that help them escape these patterns. The greatest journey a leader can make is into a world of self-awareness, mindfulness, and curiosity. 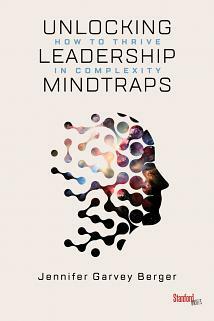 Unlocking Leadership Mindtraps is a pioneering handbook that I believe will help generations of leaders navigate complexity and find fulfillment. In this book, Jennifer explains key skills: listening to learn, disagreeing to expand, resolution to deepen relationships. I wish that every leader, and every person, would read this in today’s increasingly interconnected yet polarized world! This book is deceptively brilliant. It offers a host of very accessible practices that will result in creating the agile, innovative, engaged organizational conversations and cultures that can thrive amid complexity. I don’t know how Garvey Berger has managed to capture so much wisdom in such a small compass, but I do know we are all the beneficiaries! Thought-provoking, insightful, and empowering. This book opens up academic research to a broader audience, encouraging us all to expand the limits of our thinking. Jennifer’s work continues to inspire me.